Trim fat from steaks. Sprinkle steaks lightly with salt and steak seasoning. Preheat a large nonstick skillet over medium-high heat. Add steaks to skillet; reduce heat to medium. Cook 8 to 10 minutes for medium-rare, turning occasionally. If steaks brown too quickly, reduce heat to medium-low. Remove from skillet; cover and keep warm. Add sweet potato to skillet; cook and stir for 2 minutes. Add chutney, dried cherries, and raisins; cook and stir gently until heated through. Season to taste with salt and steak seasoning. 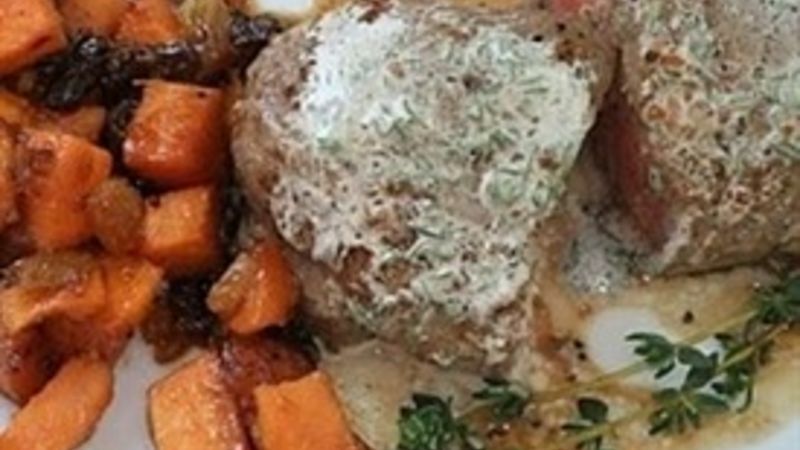 Serve steaks with sweet potato mixture and, if desired, sprinkle with thyme. Top with Thyme Butter.